On the StarWars.com main page, there is an article about Xwing. In the article, it mentions that both the Uwing's and Tie Striker's wings move. I knew about the Uwing, but not the Striker. Did I just miss that or was that not mentioned before? To compensate, Franz-Wichlacz tweaked the design (...) For the U-wing, the distance between the engines was widened to sell is as a large ship, even though it's clearly no bigger than K-wing, I mean to have some space where our lazy model design team could put the wing-hinges into, err, improve the overall look on the smaller scale, he added. Wow, you're kind of a piece of crap, aren't you? And what exactly would you know about small-scale modeling? Would YOU be able to make a 100% accurate U-Wing at that scale with the moving wings from scratch that LOOKED GOOD, was able to be easily mass produced and painted, and cheap enough to be able to make a profit off it? If you're so good and knowledgeable about it, why aren't you working for FFG? Cant wait to paint a blood red stripe on one for Duchess. The movable wings are just as glorious as I thought they would be. They look fantastic in either the up position, or perfectly horizontal. But thanks for reassuring my beliefs about internet forums still having a shiny representative for easily triggered fanboys who prefer ad-persona insults instead of bringing a valid comment to what was a lighthearted joke to begin with. 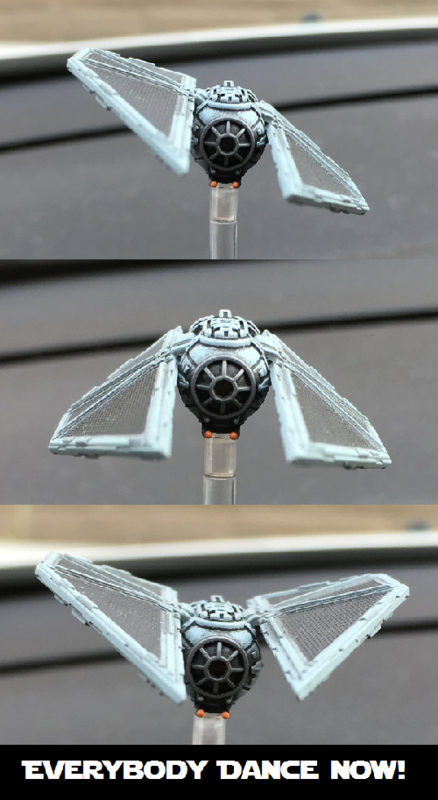 On the topic itself - curse TIE Striker for having me decide which wings' position I like more! Feels like it needs one of those "emotions exercise" sets of pictures that people do to practice drawing facial expressions, hehe. If it doesn't fly like that in the movie, I will be disappointed. I want to see a whole flock of TIE Strikers descending on a squadron of X-Wings like that. That;s just for landing man. That TIE looks like it's in a dance-off. Kinda thinking more like TIE Sloop, TIE Bunny, and TIE Donkey. Cool, if they can put movable wings on a TIE, they can put movable wings on a Gunboat. I'm going to be gluing mine anyway, as I don't want them to get loose and start flapping or only sitting in the down position. 3 will be glued up, 2 down.